The Philadelphia Flyers announced that they have acquired the rights to 5’10”, 195-pound defenseman Kimmo Timonen (KEE-moh TEEM-oh-nehn) and 6’2”, 210-pound left wing Scott Hartnell from the Nashville Predators in exchange for the 23rd overall pick in the 2007 NHL Entry Draft, according General Manager Paul Holmgren. "We are very excited in acquiring the exclusive rights to negotiate with Kimmo Timonen and Scott Hartnell," said Holmgren in making the announcement. “Both of these players are going to be unrestricted free agents on July 1. This was an opportunity to get our foot in the door a little sooner. We are extremely excited about adding these two players to our roster. 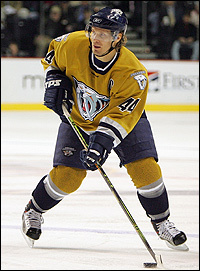 Timonen, 32, posted 55 points (13G,42A) and 42 penalty minutes in 80 games for Nashville this past season. His 55 points were first among Nashville defensemen and were tied for 11th among NHL defensemen. His 42 assists and 55 points were new single season career highs. He led the Predators in power play points with 26 (8G,18A) and average time on ice (21:50). He was second on the team in plus/minus (+20) and in blocked shots (115). He has registered 40 or more points in each of the last five seasons and has averaged over 20 minutes played per game for the last seven seasons. In eight seasons with the Predators (1998-99 through 2006-07), Timonen has recorded 79 goals and 222 assists for 301 points and 348 penalty minutes in 573 regular season games. He is first on the Predators All-Time List in points (301), assists (222) and games played (573). 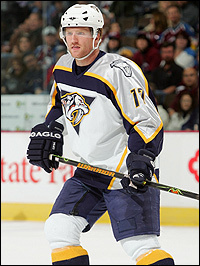 He was named the third captain in Predators history on October 3, 2006. He has participated in two NHL All-Star Games (2004 and 2007) and in three Winter Olympic Games as a member of the Finnish Olympic Team. He was named to the All-Tournament Team as Finland won the Silver Medal at the 2006 Winter Olympics. Timonen was originally drafted by the Los Angeles Kings in the 10th round (250th overall) of the 1993 NHL Entry Draft. Timonen’s brother, Jussi, posted four assists in 14 games with the Flyers this past season. Hartnell, 25, recorded 22 goals and 17 assists for 39 points and 96 penalty minutes in 64 games for the Predators this past season. He was second on the team in power play goals with 10 and was tied for third on the team in plus/minus at +19. In parts of six seasons with Nashville (2000-01 through 2006-07), Hartnell registered 93 goals and 118 assists for 211 points and 544 penalty minutes in 436 regular season games. He is first on the Predators All-Time List in penalty minutes with 544. A native of Regina, Saskatchewan, Hartnell was originally drafted by Nashville in the first round (sixth overall) of the 2000 NHL Entry Draft. The Flyers acquired Nashville’s first round pick, 23rd overall, in the 2007 NHL Entry Draft, along with Scottie Upshall, Ryan Parent and a third round pick in the 2007 NHL Entry Draft, in exchange for Peter Forsberg on February 15, 2007.